Mardi Gras celebrated the Mardigrasoutlet.com way! After weeks of long days and countless orders, the "krewe" at Mardigrasoutlet.com took a much needed break to enjoy Mardi Gras in New Orleans. What better place to do that than a balcony over Bourbon Street stocked with more beads and throws than we could possible throw in 7 hours...Or could we? Afterall, this is a group of people who know beads. 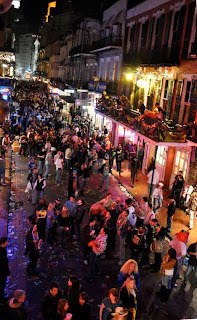 And New Orleans Mardi Gras was packed with carnival goers clamering for beads. 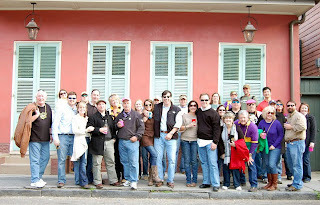 Our road trip to the city was on Sunday of Mardi Gras. It was a great night to be in New Orleans. Bachus was rolling and Drew Brees was the main attraction. On the heals of a victory in the Superbowl, the Saint's quarterback Drew Brees was king of New Orleans, not just Mardi Gras. I think everyone in Louisiana and maybe the south was in New Orleans for Mardi Gras this year. Take a close look at this picture. The Bachus parade was just ending. From up on the balcony, we got to see the crowds roll into "the quarter" like a giant wave. The streets went from crowded to a sea of faces in minutes. Everyone was celebrating a great carnival season and a Saint's victory. 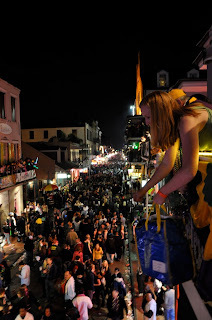 The crowds from below yelled that familiar phrase of Mardi Gras "throw me somethin, mister!" And throw we did. Long metallic beads, light up medallions that flashed at night, fancy handstrung beads, fluffy feather boas, crazy hats, and some beads larger than my head. It was great fun! Late that night as we got to the bottom of that huge stack of boxes of beads and throws, the rain rolled into town. 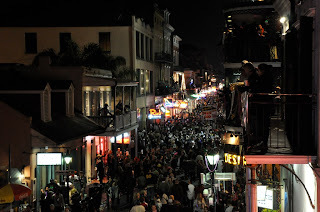 Some die hard revelers stayed on the streets, but the majority of the crowds headed inside to sample famous and infamous New Orleans cocktails. Our group headed inside to the dance floor. It was a perfect day for a road trip to the crescent city. A great victory, a beautiful city, family, friends, good music and an amazing Mardi Gras celebration! Good times, Good times...bon temps! This wreath looks impressive, but is so easy to make. I was inspired to create this wreath by one I saw on a friend's door during Christmas in red and green. 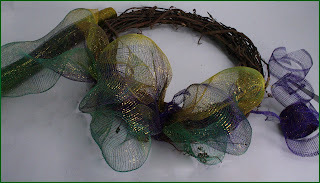 I immediately thought of the purple, green and gold Sinamay Garland, I love to decorate with for Mardi Gras. 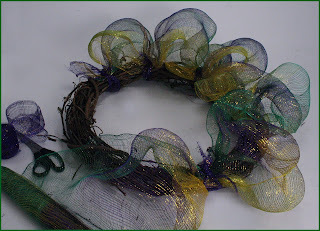 I think this wreath is fun and festive, exactly what Mardi Gras is all about. And it was easy to make with minimal supplies. Sinamay is an amazing natural product that is very versatile. Sinamay is a woven fabric or riboon made from Abaca fiber. It is also know as manila hemp. The natural fibers harvested from the Abaca plant (similar to the Banana plant that grows here in the South) are cut, dried, colored and then woven together. A huge array of products from hats to ribbon to gift bags are available out of Sinamay. It is a wonderful sustainable, eco-friendly product. I love using it because it is so versatile. I have made placemats, wrapped gifts and made huge bows out of it. The natural fibers are stiff so they hold a shape with out the need for wire. Roll of matching 2" Sinamay Ribbon or clear string. For this project I used two sizes of Sinamay. 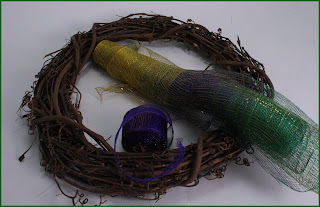 One wide 18" Sinamay garland roll in the purple, green and gold Mardi Gras colors and a narrower 2" purple ribbon roll. I like the added contrast the smaller ribbon adds but you could opt for a clear string that would not show at all. 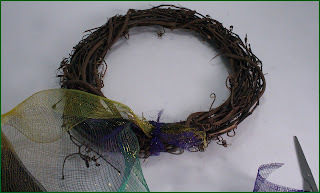 For the base of this wreath, I used a plain grape vine wreath, but you could use a regular wire form. I prefer the grape vine form because my front doors are french doors with glass so the back of the wreath shows through when you are inside. To start the wreath, I cut a few pieces of the 2" ribbon in 10" long strips (about 8). You can cut more if you need later. Start with the 18" Sinamay garland. Gather the end piece together and tie to the front of the wreath form with the smaller ribbon strip. Tie in a double knot. Move down the wreath a few inches and repeat this same step. Keep the distance between ties consistent around the wreath. Closer together looks more "puffy", further apart looks more "free form." Don't worry to much about this being perfect. 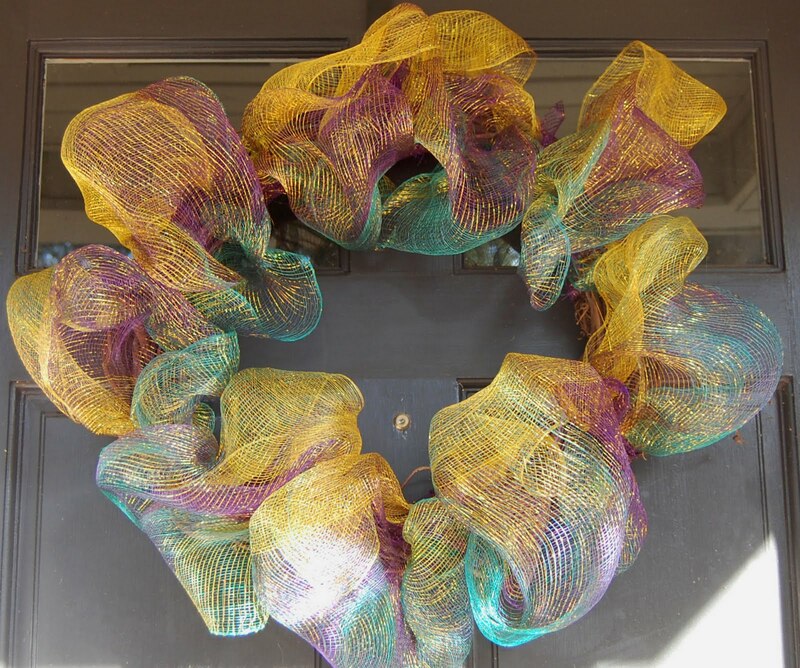 This wreath is supposed to look fun and the ribbons can be adjusted if you need at the end. Continue around the wreath until you get back to where you started. Cut the end of the 18" Sinamay garland in a distance that matchs the loop before and tie it down with a smaller ribbon. I tied a second ribbon directly over the first ribbon I started with. Fluff the loops and ribbon around the wreath. And your DONE! What a impressive project with very little effort and no messy glue sticks! Hang it up and ENJOY! This project could be personalized for your needs in so many creative ways. Change up the color combination for a different holiday. Add a second 18" Sinamay garland for a bigger pouf around the wreath. Tie or glue on colored ornaments or balls for some added sparkle. I hope you are inspired to create a wreath of your own. MardiGrasOutlet.com now offers an affordable synthetic version, Deco Poly Mesh. It comes in a huge selection of colors, sizes, styles and finishes. 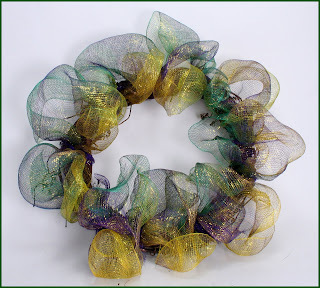 We also have video tutorials on how to make wreaths from deco mesh and work wreath forms. The Mardi Gras Wreath instructions video can be found here.